I am Barton Chao, founder of the InterValue project. On behalf of all my colleagues from the InterValue team, I would like to express my sincere gratitude to you. Thank you for your interest in the InterValue project and for the continuous support that you have shown since the beginning of this endeavor. The blockchain industry is developing very fast. More and more talents, capital, governments and industry leaders are breaking into this space. The pace of this development is much higher than the one experienced by the Internet industry in the previous years. Although the blockchain industry as a whole is at an early stage, competition has become increasingly fierce and this will eventually become a giant industry. Before the creation of the InterValue team, our main work had consisted in thinking about the current pain points experienced by this industry. How to do something that is really beneficial to the development of the industry in its early stages? In addition to providing payment and fundraising functionalities, what other features with real use can be developed within the blockchain space? After the team was formed, its members conducted many in-depth discussions regarding these issues, we combed the team's understanding of the current blockchain industry and what they think could be the future possible development trends. We deducted from our research that infrastructure is the bottleneck that reduces performance, usability, and security within the public blockchain space, and greatly limits the practical applications of blockchain technology. The primary goal was to solve the fundamental problems of current blockchain technology. First, explore how to gradually apply blockchain technology in various fields and various industries, and finally explore how to solve some problems that the Internet, artificial intelligence and other technical means have been unable to solve. This paved the way for the foundation of InterValue. As you know, the InterValue project's ERC20 Token INVE officially got listed on exchanges on September 26, 2018. This is a new starting point for the InterValue team and for you who continue to pay attention to the InterValue project and endorse the InterValue concept. 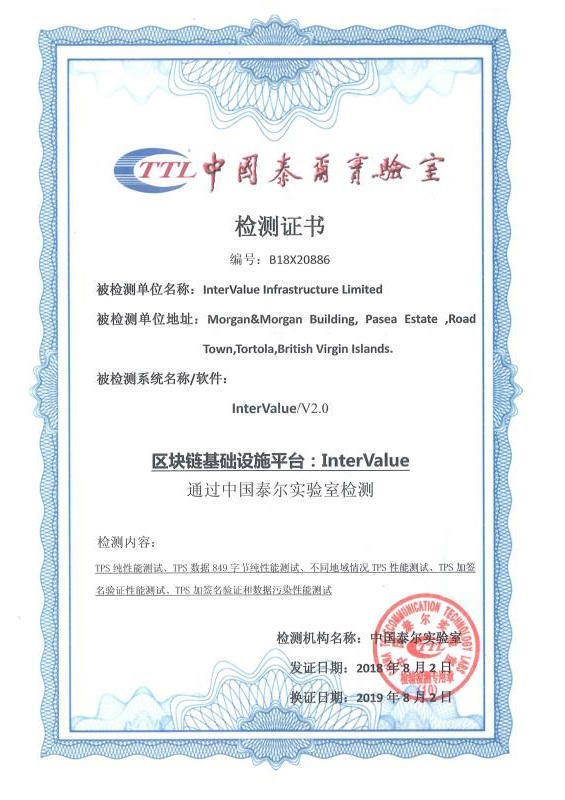 The InterValue team was officially formed in July 2017. 13 months have passed and the whitepaper has undergone more than 20 updates. Different TestNets were released: 1.0, 2.0, 3.0, which is currently undergoing intense research and development and beta testing. InterValue’s mainnet is expected to be officially launched at the end of 2018. Now, the InterValue project has implemented the HashNet consensus mechanism and performance tests show measurements of over 4 million TPS within the network. We reached a milestone in our goal to promote highly-scalable blockchain applications. The team’s hard work enabled the successful development of the DAG-based consensus mechanism based on sharding, the massive scalability introduced by high TPS, Turing-complete smart contracts in an asynchronous consensus environment, cross-chain exchange of assets and data, and the support of multi-industry applications. Some other major breakthroughs brought by InterValue include verification functions, anti-quantum attack encryption algorithms, and hash functions, transaction data anonymity and inter-node communication anonymity, user-friendly DApp development API interface, etc. They solved many key recurring problems in the blockchain space. The complexity and difficulty of many of these problems have exceeded our expectations to a certain extent. As the project was moving on, the team was unable to understand some architecture designs initially planned and unable to proceed to some specific features implementations. However, with the help of public resources, the team performed an extensive exploratory work and as it was solving problems one after another, it gradually realized the sense of its mission. Whether they are academic or practical, these problems have been solved one by one, symbolizing the firepower of the InterValue team. The team is gradually growing and getting stronger and stronger. As blockchain practitioners, we all know that the most important part of the blockchain industry is the achievement of a consensus. It is not only what gives the investor the first idea about a project and a team, but also what attracts developers and blockchain enthusiasts. Identity is very important. Since the creation of the InterValue project team, we have been strongly focused on technology and boast deep expertise in computer science, mathematics, large-scale project architecture design experience, and strong engineering implementation. This enables the exploration of blockchain technology and its frontiers: key technology research, large-scale project architecture design, full-process management and control, practical engineering implementation capabilities as well as the team's collective strength, perseverance, execution, and other qualities are essential for a project to succeed. As a blockchain infrastructure project, the construction of an ecosystem is the foundation of the success. It is crucial. We sincerely hope that more and more blockchain application development teams will build applications based on InterValue. INVE token listing on exchanges is a small step forward in our great journey. We still have a lot of work to complete, I hope you can continue to pay attention and show your support as you have always done. On behalf of the team, I would like to ask you to give InterValue some time to grow, and I hope that you can contribute to the development of InterValue. We are convinced that blockchain will eventually change the world. Let’s start with the optimization and improvement of the blockchain technology, then let blockchain gradually change all aspects of our lives. My team and I are willing to work with you to begin a new blockchain era based on the InterValue ecosystem.